I have chosen to homeschool SG for preschool this year. I am actually a former public school teacher. Once upon a time in a land far far away from Iowa, I taught first grade. For four years! 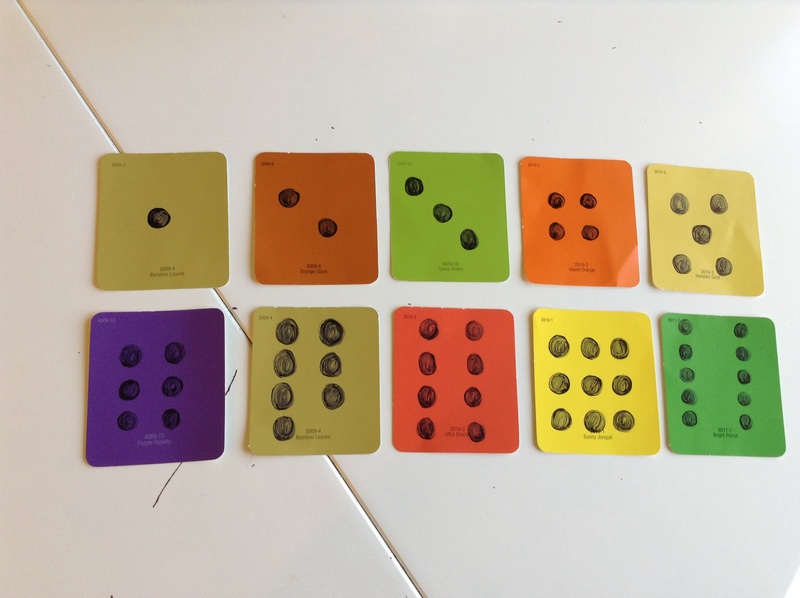 Today I’m going to focus on easy games that use paint chip samples. 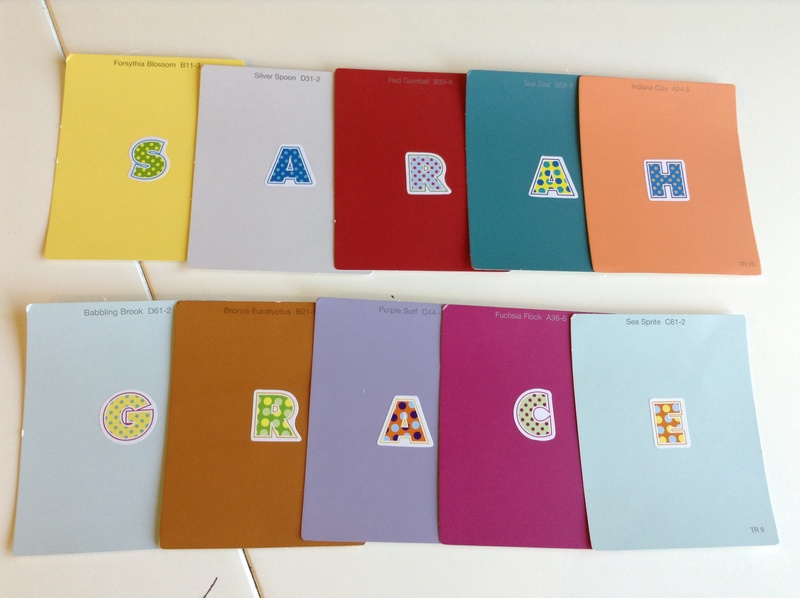 I saw a few pins on Pinterest that used paint chip samples (here on out referred to as PCS). The best thing about PCS are they are FREE! SG randomly collects them when we shop at Lowe’s. It keeps her busy while I browse the actual colors I like. I had a pile of PCS and started there. A quick trip to the Dollar Tree for a pack of paper clips and clothespins and I was ready to go. I also had Sharpies at home and some stickers. 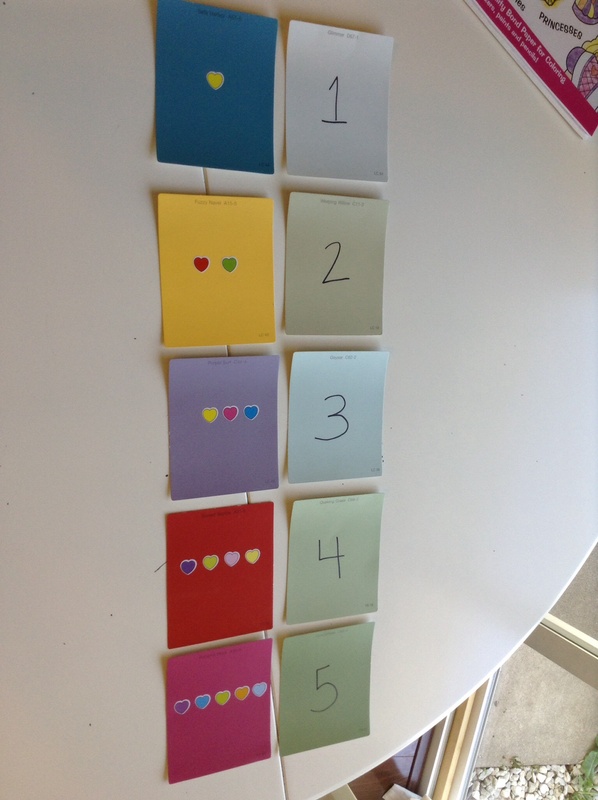 That’s all I needed to make a few easy and cute preschool games. 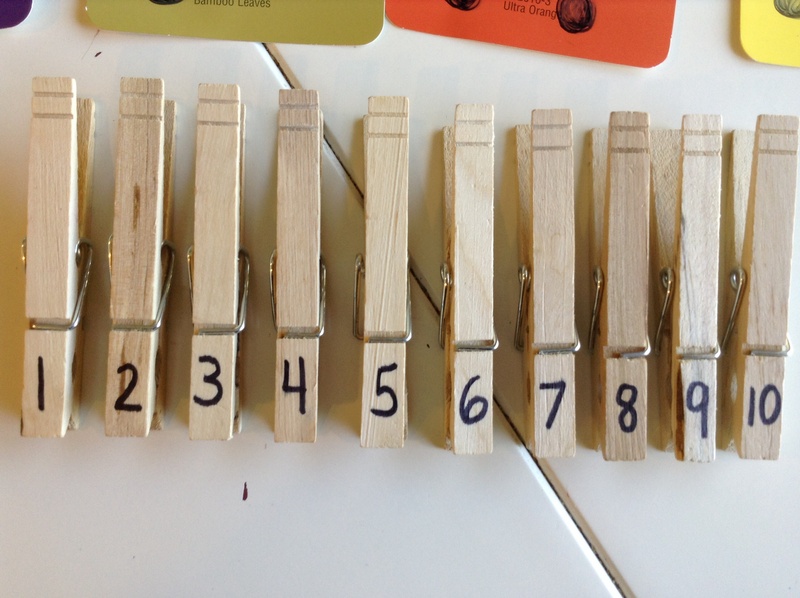 Using a Sharpie, write the numbers 1-10 on ten clothespins. Use 10 PCS and color dots using the Sharpie for each number. One dot for one, two dots for two, etc. We currently focus on 1-10, but you could do 1-20 or counting by 2’s to 10 or 20. Store in a plastic baggie. I colored circles with a Sharpie. Round stickers would also work. Mix up the cards and clothespins. 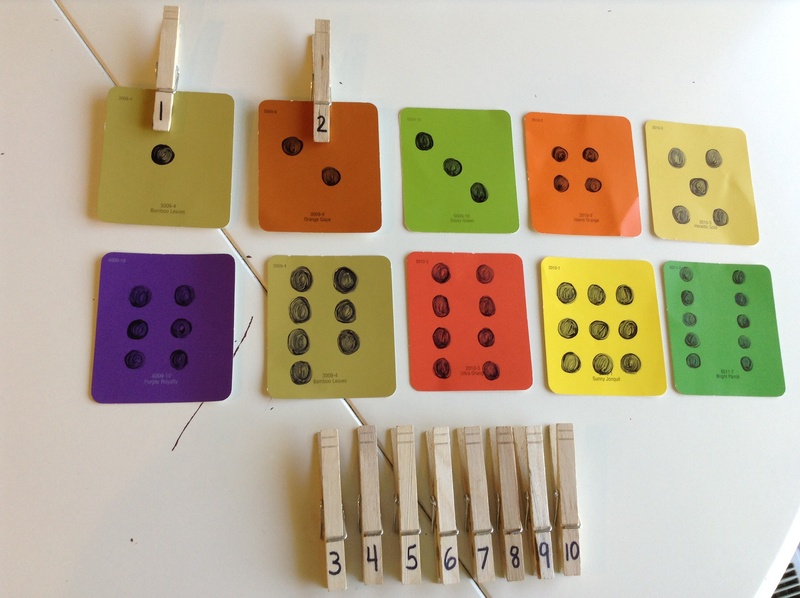 Count the dots with child and find the matching numbered clothespin. Let child clip it on the correct PCS. You may have to assist several times before child can play alone. 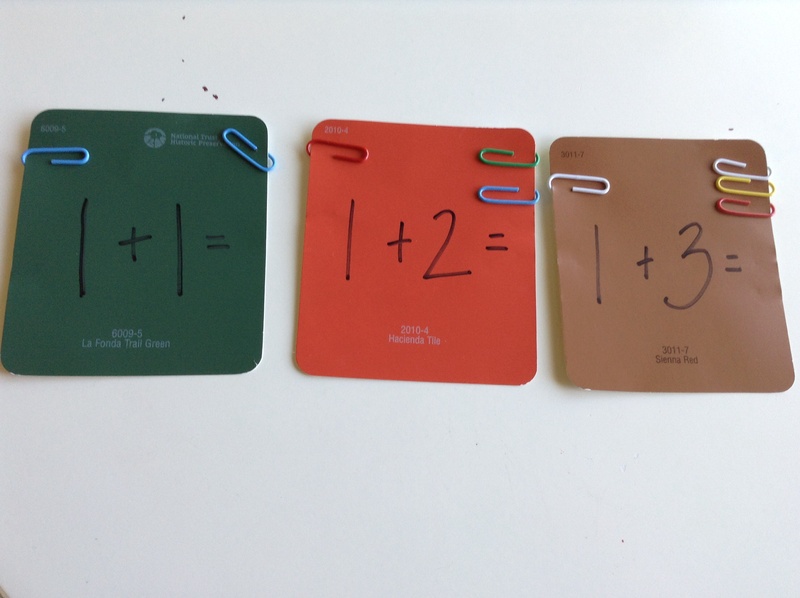 For an added challenge, ask child to put the numbers in the correct order after the clips have been added. Use a Sharpie to write child’s first, middle, and last name on PCS. One name per PCS. Then write one letter per PCS for their full name. 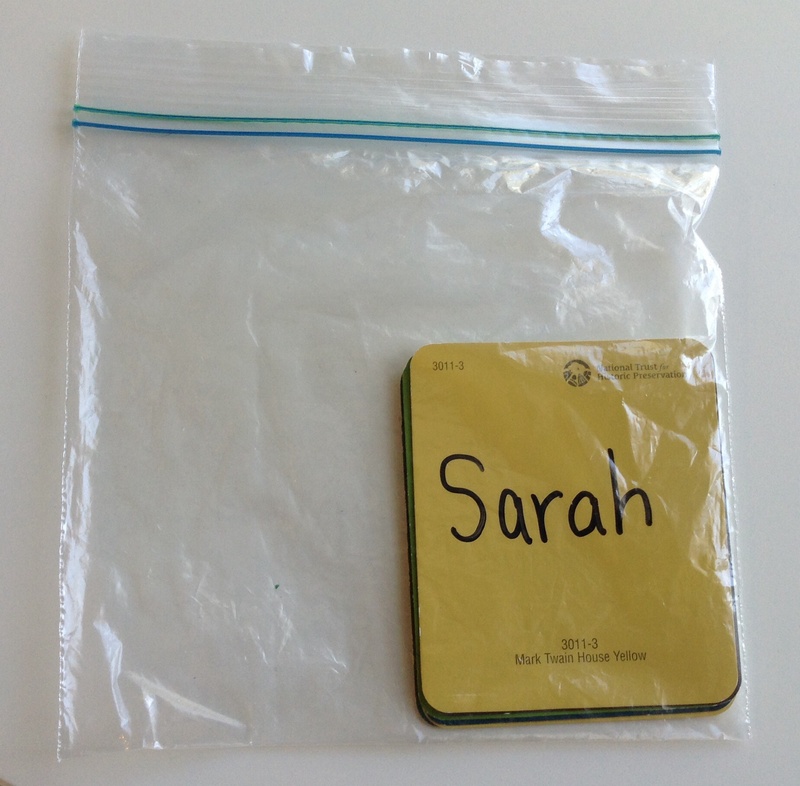 Keep the letters for each name in a separate plastic baggie. Put the whole name in front of the individual letters and store on top of the baggie. We do this for SG’s first, middle, & last name. I store this with the name card on the front so I can easily grab this game & stay organized. Place the name card on a surface. (We play this on the floor.) Mix up the letters that spell that name. 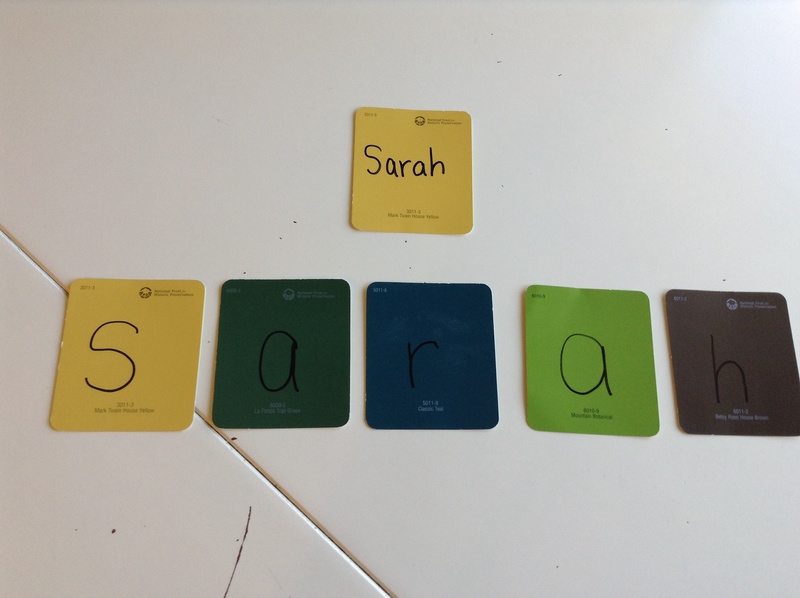 Show child how to spell her name using the name card as the guide. Eventually, the child can do this by herself. SG now doesn’t need the name card. She uses it to check herself. This game taught her how to spell her name in just a few weeks! And we only played it 2-3 times a week! Choose 5 PCS and write the numbers 1-5 and spell it out under each number. One number per PCS. Count out 15 paperclips. Store both in a plastic baggie. Show child the number 1 and point to the word “one.” Explain she needs to put 1 paperclip on the PCS for the number 1. Repeat with 2, 3, 4, & 5. 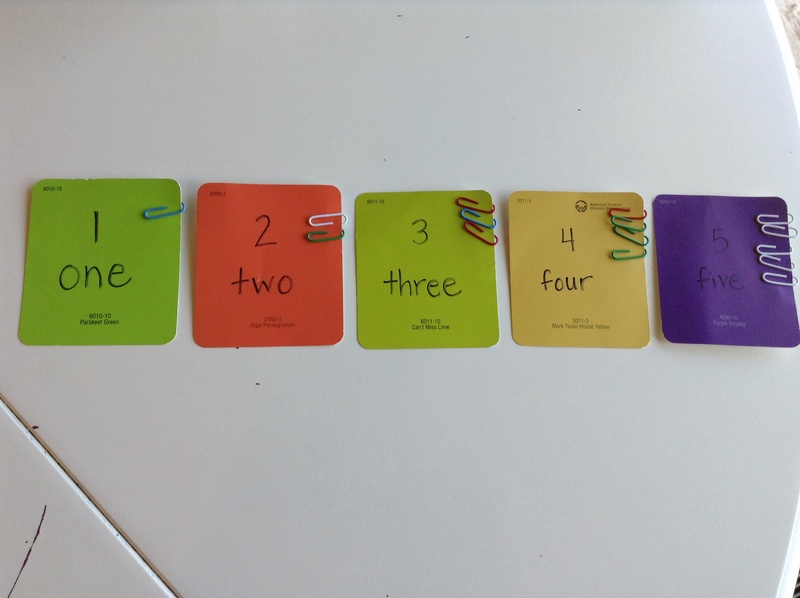 For a challenge, mix up the cards, have her clip the paperclips herself and then put them in order from 1-5 or descending from 5-1. Choose 5 PCS and write the numbers 1-5 on the PCS. One number per PCS. Choose 5 more PCS and put one sticker on the PCS for the number 1, two stickers for 2, etc. (I chose to use the same stickers for each PCS because I didn’t want SG memorizing a butterfly sticker for number 1, two balloons for number 2, etc.) Store in a plastic baggie. Mix up the sticker PCS and mix up the numbered PCS. Assist child in matching the number 1 PCS to the PCS that has one sticker. Repeat. For a challenge, mix them all together, the stickered and numbered PCS. Have child match them alone and order them from 1-5 or from 5-1. You will need one PCS per letter of child’s name. I put one letter per PCS. I did it for SG’s first and middle name. I stored both names together in one bag. If child isn’t ready for this, store one name per baggie. Have child spell her name, assisted or unassisted. Choose 3 PCS. Write these math problems on them using a Sharpie: 1+1= 1+2= 1+3= On the other side of the PCS, write the answers. 2 3 4 Store in a plastic baggie along with 9 paperclips. This is how SG checks her answers. Tell child you are going to teach them how to add numbers. Show her the first PCS of 1+1=. Have her put 1 paperclip above the first number 1 and another paperclip above the second 1. Tell her you are both going to add the paperclips. Count them together. Then tell her it’s just like that for the math problem. 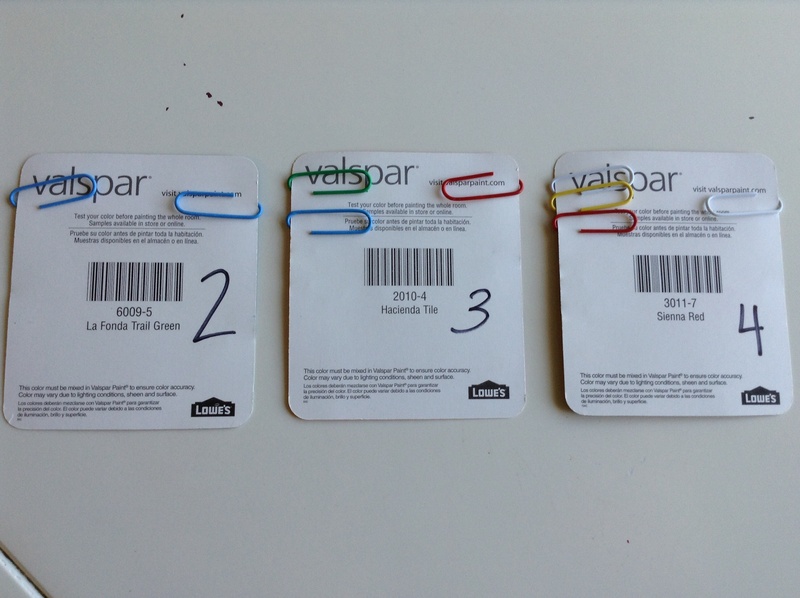 Point to the math problem and say, “1+1=…” Then count the paperclips again. Ask her what 1+1=. If she doesn’t say two then you can tell her. Show her how to check her answer by turning the PCS over for the correct answer. (Note: My exact wording isn’t needed. I typed it out as an example of how this can be worded. Feel free to say what works for you and your child.) Repeat per PCS and add more addition problems when child is ready. I keep all of these games in an inexpensive photo box. The box also matches my living room decor, so the games are nicely camouflaged in our living space. SG enjoys these games (especially the paperclip ones!). I love that these games were simple to make and have taught SG a great deal already! I hope this post has brought encouragement to someone out there. I have more ideas to share for another day. What about you, friend? Do you have any easy and frugal preschool ideas?